I'm working on a wall hanging for my living room. 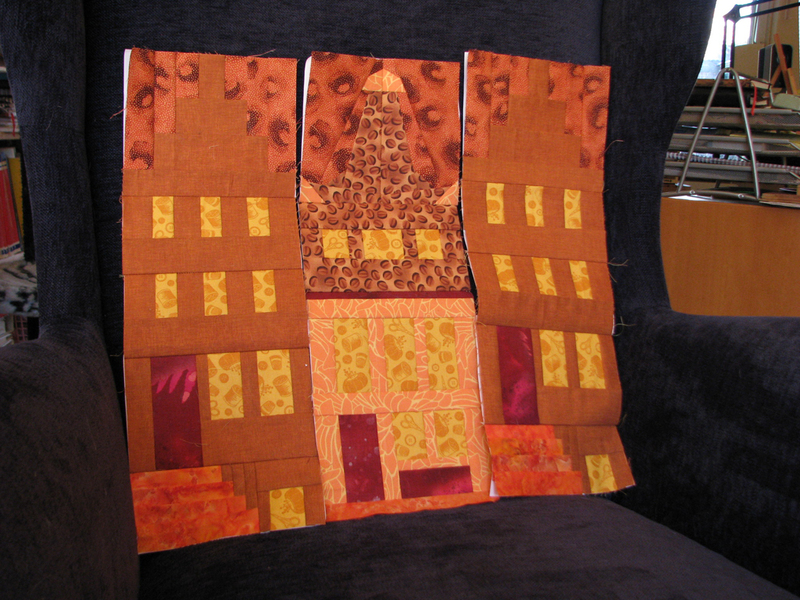 The pattern is by Maaike Bakker. Most if not all of her designs are paper foundation piecing. I bought it several years ago at a craft show after seeing the finished version of it. It was also available as a kit, including all fabrics in different shades of blue, but I wanted to use different colors. The Singer 127K proofs to be perfect for paper foundation piecing, because you're not sewing continuously. After all, every time after you've added another piece, you have to trim it, flip it and press. With an electric machine, you'd leave it switched on obviously until you're done for the day. Which means I have to watch the cats while I'm not using the machine. Cats are just like small children. I admit, neither of them ever touched the foot pedal yet, but you never know. The 127K is a vibrating shuttle machine, that takes long bobbins. I'm very pleased with how much I can sew before the bobbin thread runs out. 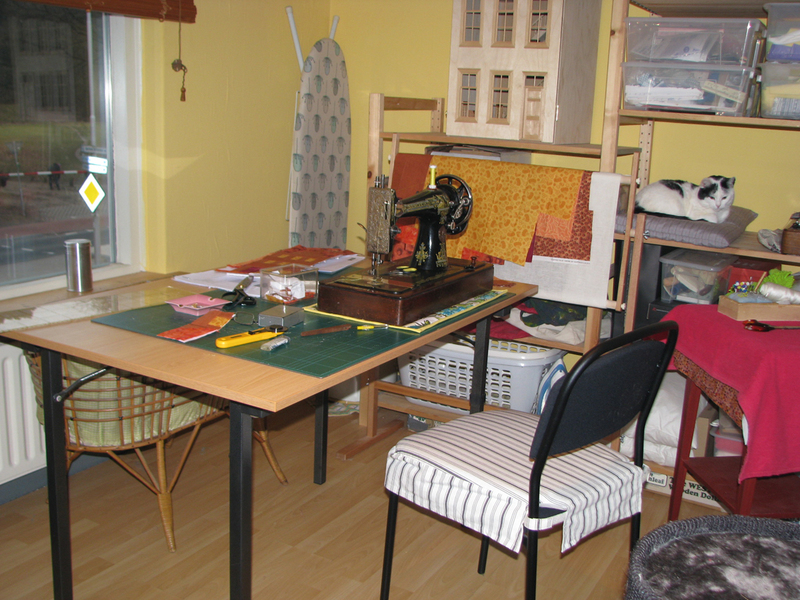 My regular sewing room is actually adjacent to this room. When I moved here two years ago, I naturally chose the biggest room as a craft room. As it turns out, the light is not ideal in the bigger room, plus it's quite cold in winter. And the view from the room I'm currently working in, is so much nicer. I live across a wood. Well, here it is: the first picture! 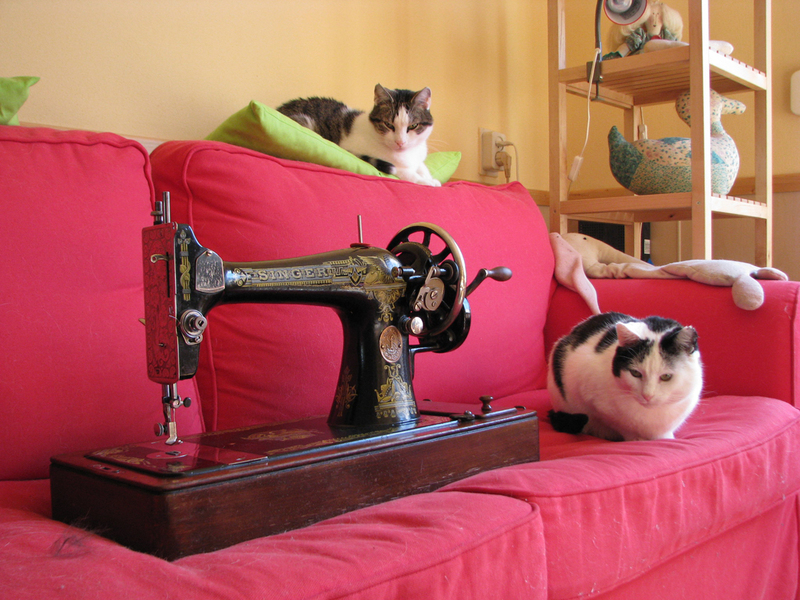 This is the first vintage sewing machine I purchased. She was manufactured in 1917. She was 2yrs old when my Mum was born. Fortunately she was fully functional, because I didn't know anything about vintage machines. I just chose her, because she was pretty. She came with 1 long bobbin only, and no attachments at all, but I was relieved that she was ready to use. Well after cleaning and oiling her of course (many thanks Muv, for the superb video). After Easter, she'll go the shop to get her checked. That was a difficult decision. I wanted the feel of acomplishment, that you get when you're able to repair and maintain your sewing machine yourself. The Singer 15 came with an unfamiliar tension unit, at least for me. It had no numbers on it, and it didn't look anything like the one on the Singer 127 either. I wasn't sure whether the take up spring was positioned correctly, and worse: the whole tension unit came apart when I accidentally turned the knob the wrong way. The repairman did a great job, I must say. The tension spring proved to be put in incorrectly, and he did a minor repair on the tension unit. Apparently he wasn't satisfied with how I had cleaned/oiled the machine, because he did that as well. And, truth be told, he did better than me: the machine purrs like a kitten. That's why I want him to check my Singer 127 too. Then she's off to a good start at least, and gives me the opportunity to keep her that way. The blog has been primarily created to show my vintage sewing machines. I own two hand crank Singers: a Singer 127K and a Singer 15.